A credit rating is an opinion of a particular credit agency regarding the ability and willingness an entity (government, business, or individual) to fulfill its financial obligations in completeness and within the established due dates. A credit rating also signifies the likelihood a debtor will default. Essentially, it is representative of the credit riskCredit RiskCredit risk involves managing the creditworthiness of all entities a firm lends to, including bondholders. Credit risk is the risk of loss that may occur from the failure of any party to abide by the terms and conditions of any financial contract, principally the failure to make required payments on loans carried by a debt instrument – whether a loan or a bond issuance. A credit rating is, however, not an assurance or guarantee of a kind of financial performance by a certain instrument of debt. The opinions provided by a credit agency do not replace those of a financial advisorFinancial AdvisorA Financial Advisor is a finance professional who provides consulting and advice about an individual’s or entity’s finances. Financial advisors can help or portfolio managerPortfolio ManagerPortfolio managers manage investment portfolios using a six-step portfolio management process. Learn exactly what does a portfolio manager do in this guide. Portfolio managers are professionals who manage investment portfolios, with the goal of achieving their clients’ investment objectives..
A credit agency evaluates the credit rating of the debtor by analyzing the qualitative and quantitative attributes of the entity in question. The information may be sourced from internal information provided by the entity, such as audited financial statements, annual reports, as well as external information such as analyst reports, published news articles, overall industry analysis, and projections. A credit agency is not involved in the transaction of the deal and, therefore, is deemed to provide an independent and impartial opinion of the credit risk carried by a particular entity seeking to raise money through loans or bond issuance. Presently, there are three prominent credit agencies that control 85% of the overall ratings market: Moody’s Investor Services, Standard and Poor’s (S&P), and Fitch Group. 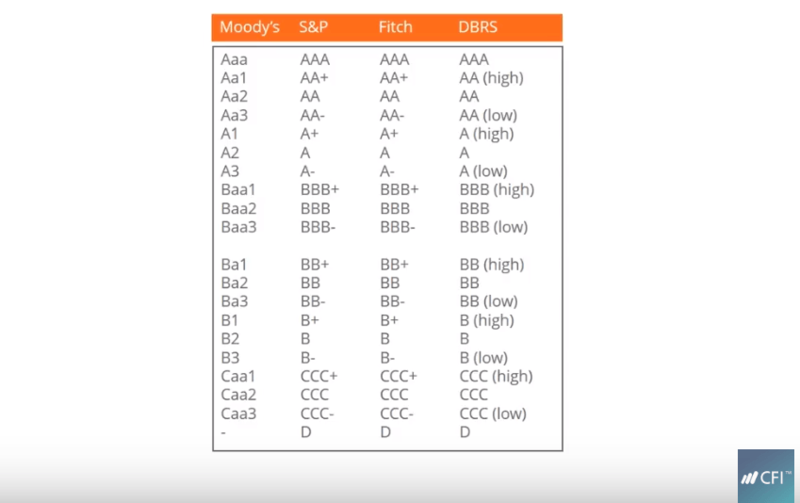 Each agency uses unique, but strikingly similar rating styles to indicate credit ratings. Each credit agency uses its own terminology to determine credit ratings. That said, the notations are strikingly similar among the three credit agencies. Ratings are bracketed into two groups: investment grade and speculative grade. Investment grade ratings mean the investment is considered solid by the rating agency, and the issuer is likely to honor the terms of repayment. Such investments are typically less competitively priced in comparison to speculative grade investments. Speculative grade investments are high risk and, therefore, offer higher interest rate upfront to reflect the quality of the investments. Credit ratings are used by investors, intermediaries such as investment banksList of Top Investment BanksList of the top 100 investment banks in the world sorted alphabetically. Top investment banks on the list are Goldman Sachs, Morgan Stanley, BAML, JP Morgan, Blackstone, Rothschild, Scotiabank, RBC, UBS, Wells Fargo, Deutsche Bank, Citi, Macquarie, HSBC, ICBC, Credit Suisse, Bank of America Merril Lynch, issuers of debt, and businesses and corporations. Both institutional and individual investors use credit ratings to assess the risk related to investing in a specific issuance, ideally in the context of their entire portfolio. Intermediaries such as investment bankers utilize credit ratings to evaluate credit risk and further derive pricing of debt issues. Debt issuers such as corporations, governments, municipalities, etc. use credit ratings as an independent evaluation of their creditworthiness and credit risk associated with their debt issuance. The ratings can, to some extent, provide prospective investors with an idea of the quality of the instrument and what kind of interest rate they should be expecting from it. Businesses and corporations that are looking to evaluate the risk involved with a certain counterparty transaction. It can help entities that are looking to participate in partnerships or ventures with other businesses evaluate the viability of the proposition. A credit rating is used to determine an entity’s creditworthiness, wherein an entity could be an individual, a business, a corporation or a sovereign country. In case of a loan, the rating is used to establish whether a loan should be rendered in the first place. If the process goes further, it helps in deciding the term of the loan such as dates of repayment, interest rate, etc. In case of bond issuance, the credit rating indicates the worthiness of the corporation or sovereign country’s ability to repay the bond payments in due time. It helps the investor evaluate whether to invest in the bond or not. A credit score, however, is strictly for indicating an individual’s personal credit health. It indicates the individual’s ability to undertake a certain load and his or her ability to honor the terms and conditions of the loan, including the interest rate and dates of repayment. A credit score for individuals is used by banks, credit card companies, and other lending institutions that serve individuals.